Discussion in 'Ad Campaigns' started by Greenway, Dec 30, 2015. I like the pop of color but otherwise it looks a bit depressing imo. 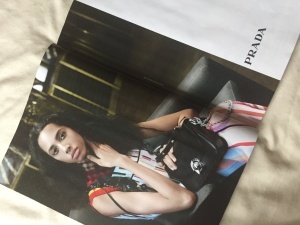 But why are all the Prada models always looking depressed? Love the art direction...coupled with the set design and photography, this is reminiscent of Meisel's mid Noughties Prada ads, which is no bad thing. Yasmin looks quite gorgeous here and I'm into the fact that the whole ad looks like it will veer in a more classic direction than the runway show. I kinda like it! It looks good (i wasn't a fan of the collection). I'm looking forward for the others shots but this collection needed Sasha P.
Good God, looks like the PC gang will be silenced next season. The shot is just passable. I cannot see the clothes and the bag is hideous. Who's the girl? I am crazy about the eyebrows! How to they say it these days? Fleek? I need to see more before making a conclusion, it looks absolutely boring to me, it doesn't look like Prada, not even made by Meisel, I would say McDean or Sims instead. I'm just not feeling it. Wow this is such a strong shot. Could've easily been a VI cover. Plus, the model is so stunning! Hopefully, Meisel will take her under his wing! Amazing! What a strong shot. I'm really feeling it, can't wait to see the rest. She looks elegant and expensive. Love the clean hair and make up styling against all those mess from the collection. Good casting! Kind of a boring shot, I think it's her expression that brings it down. Although I kinda love the styling. beautiful shot! I was expecting something more loud, I'll wait to see more to make judgement, but this definitely feels more sophisticated and directly targeted to the Prada woman than the Cruise campaign.